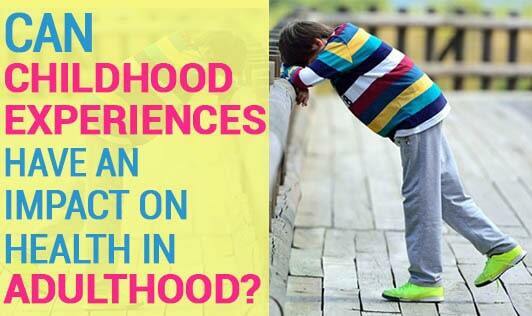 Can childhood experiences have an impact on health in adulthood? Have you ever wondered that your childhood experiences can lead to health problems in adulthood? Yes! You got that right! Childhood abuse or adverse childhood experiences can have an impact on your health as you grow into an adult. The long-term effects of childhood abuse can be understood in a health psychology framework describing the behavioural, social, cognitive and emotional pathways. Behavioural pathways are the best known of the four pathways. A very famous study called the ACE study revealed that there is a powerful relation between a person's emotional experiences as a child and adult emotional health, physical health, and major causes of mortality in the United States. The time factors in the study make it clear that time does not heal some of the adverse experiences which were common in the childhoods of a large population of middle-aged, middle-class Americans. One doesn't "just get over" some things. For instance, having adequate sleep is essential for good health. Although it is not"behaviour", it has a strong behavioural component. It has been found that adult survivors of childhood abuse often have trouble sleeping. Evidence from a study on German-speaking sexual abuse survivors indicated that 68% of the subjects had sleep difficulties, with 45% reporting repetitive nightmares. Other problems that fall under the behavioural pathway are obesity & eating disorders, suicide, and substance abuse, risky sexual behaviour, smoking and illicit drugs. Social pathways on the other hand indicate the ability to form social relationships and are essential for the wellbeing of humans. Maintaining positive social connections is also affected by the past abuse. Adult survivors often are in relationships that are victimizing. For example, the divorce rate is higher due to general dissatisfaction with their present relationships. Such relationship difficulties could be related to interpersonal style. Adult survivors are likely to adopt one of the two interpersonal styles; avoidant or intrusive. Both these styles are dysfunctional and are likely to result in loneliness. Childhood sexual abuse survivors are also at an increased risk for revictimization. Findings from a study by Fergusson indicated that women with a very high rate of child sexual abuse were likely to have been raped or domestically abused. Health is affected by revictimization through injury and potential death from each victimizing encounter. It also increases the risk of contracting sexually transmitted diseases as well as chronic stress. Chronic stress further leads to indulging in harmful activities such as smoking and substance abuse. Cognitive pathways include the beliefs and attitudes such as health perceptions which can have a substantial impact on health. For example, perceived general health has been associated negatively with childhood abuse. Lastly, Emotional pathways demonstrate potential life-threatening significance of negative emotions. Childhood abuse is common and has been associated with a plethora of psychological and somatic symptoms along with medical and psychiatric diagnoses including anxiety disorder, depression, posttraumatic stress disorder, chronic pain syndrome, irritable bowel, and chronic fatigue syndrome. As it can be seen that "health" depends on a very complex combination of behaviours, emotions, social connections and thoughts. All of these ultimately influence health and these pathways for each individual.